You are going to love this one. Shot on location inside a fitness equipment store. Together we are doing a challenging 15 minute 2 circuit workout. This workout will engage your whole body, and will get your heart rate pumping fast. Quick, efficient and fun. Can exercise be any more fun? I am super excited to share with you my 7 day Hot and Healthy Body Challenge. With the 7 Day Hot and Healthy Body Challenge you will receive tips for setting and sticking to your success goals, daily meal plan suggestions and recipes, step-by-step workout videos for each day, and more. 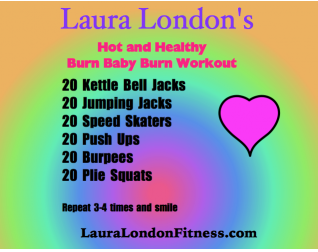 Make sure you check it out here and start getting hot and healthy today. Grab your Gym Boss Interval Timer. Don’t have one? You can get yours here.